It’s always good to see the major manufacturers commissioning bikes from new-wave custom builders. Ural got into the game early, hooking up with Hammarhead, and we’ve recently seen Yamaha get into bed with the Wrenchmonkees. 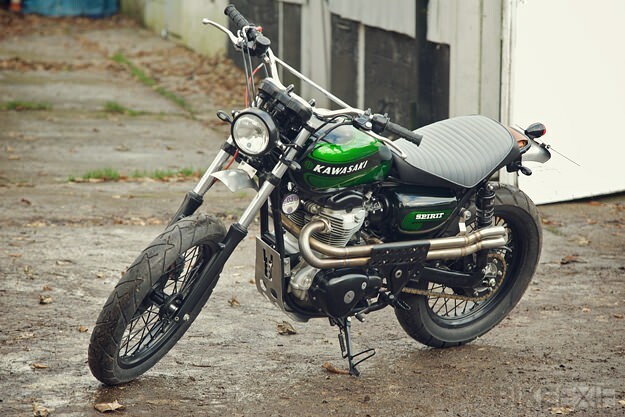 Now Kawasaki has aligned itself with the English workshop Spirit of The Seventies, and commissioned a custom W800 for its stand at the UK’s Motorcycle Live show. The W800 is a good platform, but a lot of work has gone into this machine. 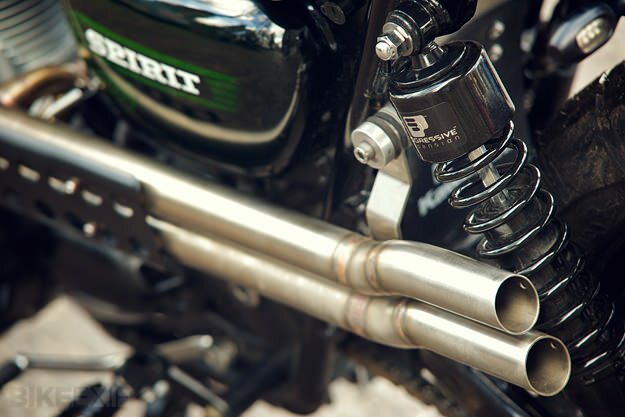 The most obvious change is the motocross bars, which are fitted with Oury grips. 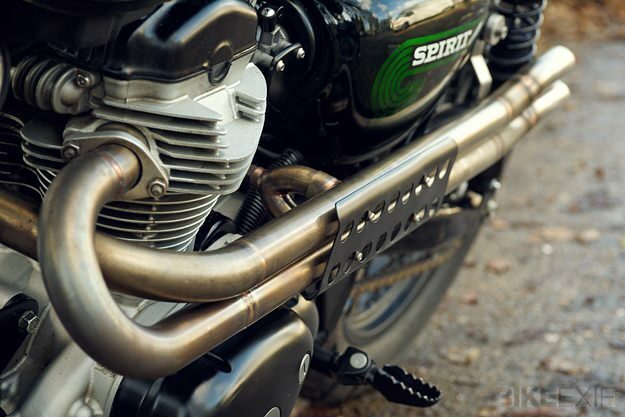 LSL headlight brackets hold Spirit’s own design of lamp, which is flanked by Oberon blinkers. 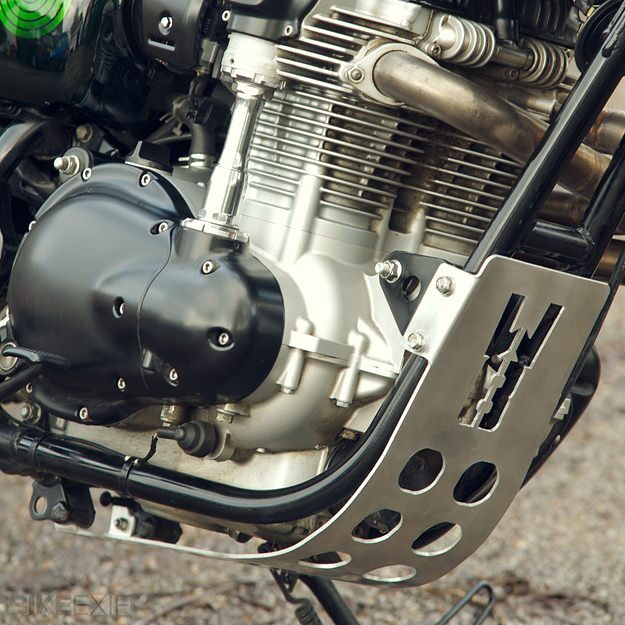 The sump guard is a custom Spirit item, and the stainless steel exhaust system was made by Co-Built to Spirit’s specifications. “It has internal baffling with removable baffles, but it’s still loud. We’ve kept the lambda sensor and it’s been test-run on the dyno,” says Tim. The stock seat was cut down and reworked before being upholstered by Glenn Moger. New custom alloy fenders were also installed: “We know the front is short and high,” says Tim. “It’s purely for looks. We’d make a larger version if it wasn’t a show bike.” The rear suspension has been upgraded with Progressive shocks, and the tires are Continental’s ContiTrailAttacks. The cases, wheels and fork lowers have been powdercoated and there’s a leather tool roll from Born+Bred Leatherworks hidden under the seat. The finishing touches were applied by Revolution Paint. 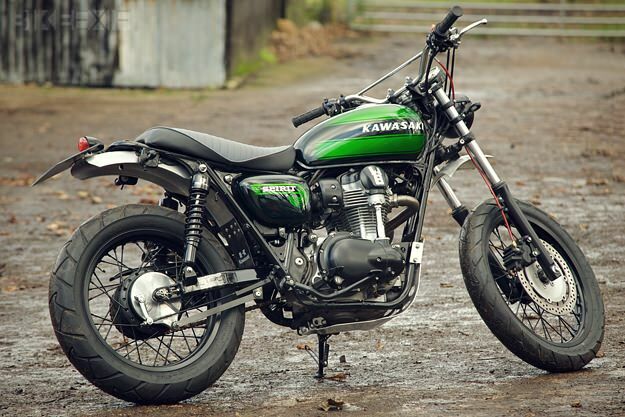 Top marks to Kawasaki UK for joining the select group of manufacturers willing to collaborate with a custom bike builder. 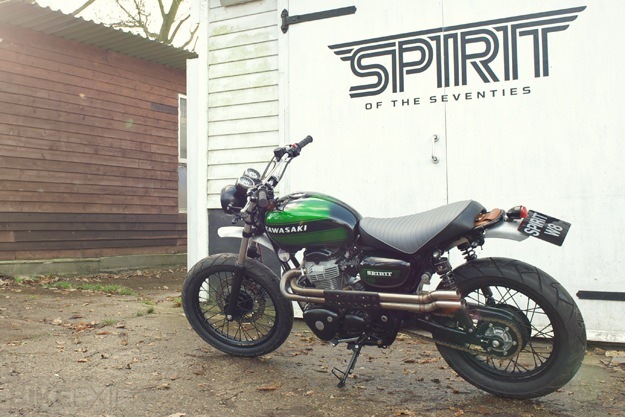 And if you like what you see, there’s even better news: Spirit is taking orders for a limited run of machines based on this W800.